Could the plan have worked? General Motor’s Lordstown, Ohio manufacturing facility shut down earlier this month after 53 years of operation. 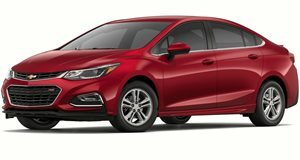 Most recently, it was home to the Chevrolet Cruze, which has also been discontinued in North America due to dwindling sales. To GM’s credit, it is trying to help the plant’s employees find new jobs, such as offering them jobs at nearby plants. Around 1,000 plant workers have taken GM up on this offer. But according to Youngstown, Ohio newspaper The Vindicator and The Detroit Free Press, a Cleveland area businessman named Bernie Moreno came up with a plan to keep the plant running and building the Cruze. Moreno owns several car dealerships that sell a variety of brands, including Rolls-Royce, Mercedes-Benz, GMC, and Buick. He reportedly reached out to GM with an offer to buy thousands of Chevy Cruzes annually for five years from the automaker. There was, however, one non-negotiable element: all of those Cruzes had to be built at Lordstown. Doing so would have retained two of the three shifts. But would Moreno want to do with all of those Cruzes? His plan was to create an Uber-style car-sharing service. Sources claim Moreno met with GM’s leadership last December with a proposal to buy 150,000 to 180,000 Cruzes for his new car-sharing venture. He wanted to buy the cars directly from GM and employ drivers. It sounds like a win-win-win situation. Moreno would, hopefully, have had a new and profitable business. GM would find a buyer for a car the public at large didn’t want anymore. And 3,000 of Lordstown’s 4,500 employees would have kept their jobs. Suppliers would have benefited as well. But no, GM CEO Mary Barra rejected the deal. She reportedly considered it but ultimately decided against the proposal due to the economics of it. Both Moreno and GM declined to comment on the proposal, each citing nondisclosure agreements. Meanwhile, Barra and GM continue to receive harsh criticism from President Trump over the fate of Lordstown. Trump wants the plant re-opened but it’s not his decision to make. If Barra, whose father was a GM plant worker in the Detroit area, finds an economical way to keep Lordstown up and running, chances are she’d do so. However, she also has a responsibility to GM shareholders to avoid losing money at all costs.